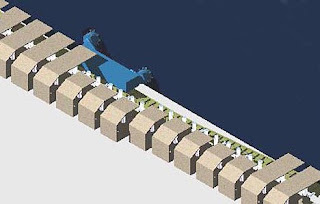 The development of longwall coal mining took a significant step forward with the development of the armored face conveyor (AFC) and the self-advancing supports of both chock and shield designs that I described last time. Put together they provide two of the three major parts of a modern longwall. The third, and the topic for today is the mining machine itself. The longwall panel with shields and a mining machine is at D.
In the evolution of longwall, an undercut beneath the face was initially cut out by a man wielding a pick. By the turn of the 19th century this was starting to be replaced by a machine, much like a giant chain saw, that undercut the face to a depth of around 5 – 7 ft. And, while in earlier times the coal was broken from the solid by hewers that used picks to break out the coal to the free face left by the slot, with machine undercutting the bulk of the coal was broken down by single sticks of explosive set into the coal at about 6-ft intervals along the face. The AFC, as well as carrying the coal away from the face, had two hard bearing surfaces at the top of each pan, which connected together to provide a path along which a machine might move. But what sort of machine was going to be capable of mining the full face of the coal. 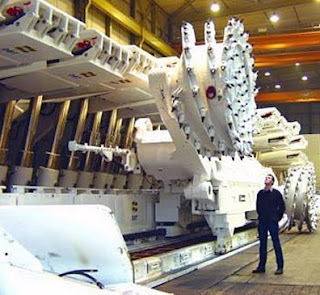 There were a number of different designs developed, many of which started with the long cutting chain of the coal cutter, and added other blades to it, in order to fully remove the bulk of the coal. I’ll mention only three of them, in passing. The first idea was simply to mount a cutting post at the turning wheel of the conveyor, deep in the cut, in order to back cut the coal, and move it out of the web. The machine had a number of teething problems and did not prove very effective in underground trials. It was quickly passed by the Meco-Moore Cutter loader which by 1956 had become one of the most popular integrated mining machines in the United Kingdom. It is important for those who talk about the energy required to mine coal to understand how it worked. This was still at the time that the roof was supported by manually placed props and bars (which can be seen in the background). However the bottom of the coal was first cut with a cutter bar that was 6 ft long. Concurrently the central part of the seam was cut by a second cutter bar, which cut a slot to a depth of 4 ft 6 inches in the coal. A third slot, at the back of the face, was cut using the triangular shaped cutter bar shown in the illustration. Coal has sensibly no strength in tension, because of the cleats and bedding planes that form within it during the process of forming the coal. Thus the web of coal that has been undercut, mid-cut and back-cut will collapse onto the small cross-conveyor, which carries it over to the main AFC. As I mentioned, the machine became quite popular, since it both cut the coal, and loaded it onto the conveyor. 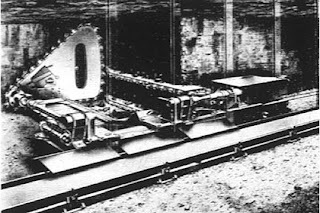 However the small cross-conveyor needed to move the coal over to the main conveyor was relatively fragile, and frequently broke, dropping production. The scene was therefore ready for two more machines, one of which I will discuss today, and the other (when I talk about mining thinner seams of coal) in a later post. The new machine was called a shearer. Developed by John Anderton, who worked for the British National Coal Board, the initial concept was brilliantly simple. 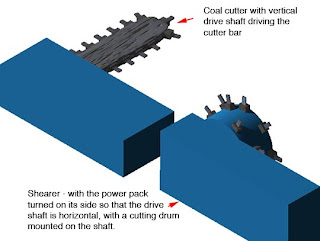 Take the coal cutting machine that was common in many mines, turn it on its side so that the drive shaft was horizontal, and mount a cutting drum to the drive shaft that used to operate the cutter bar. The picks on the drum were set on a spiral, so that as the drum turned it would feed to coal over to the conveyor, on which the machine was riding. The shape of the scroll, with and without picks, can be seen from the lower parts of the Anderton Shearer Memorial in St Helens. Lancashire. (From Lowton Websites) The lower scroll shows how the shape would, as with a wood drill, feed the coal back to the conveyor as the drum rotated. This proved to be a relatively simple machine, adaptable from existing machines in the mines and became the predominant mining machines for longwall faces. Over time the drum was mounted on a boom, so that it could range up and down to adapt to varying seam conditions, and a second drum, also ranging, was added to many machines, at the other end. In this way higher coal could be mined. Modern shearer, showing the size, and how it would integrate with the AFC, on which it rides, ahead of the shield supports which protect the miners. (Note the coal face would be where the man is standing). The machines need many less miners to operate that the fifteen men that would hand load out a face back in the early 1960’s, and now there are automated devices to detect the interface between the coal and the rock, and which can raise and lower the drums to adjust for these geological changes. First the shearer mines off a web of coal that is perhaps 2-ft deep. This is loaded onto the AFC (green) and carried away. The hydraulic rams on the shields then push the conveyor over so that it is beside the face. Then, in turn, each shield lowers, and the ram is reversed, to pull it forward the same 2-ft so that it again covers the working area. It then raises, and resupports the roof, while the support next to it is advanced. 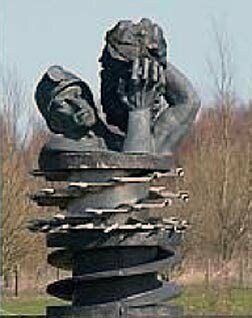 In this way the machine continuously slices off the coal as it moves the face forward. 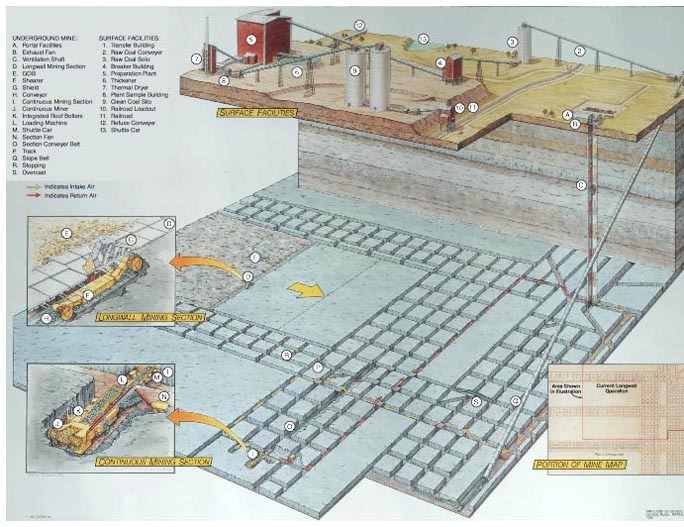 The technology allows high rates of underground production, for example, in May 2009 the Newlands Northern mine in Queensland mined 961,891 t from its longwall, 251,720 t of that in a single week. (And up to 46,000 tons in a day). The Newlands longwall is equipped with Bucyrus EL3000 shearers which have installed power of 1,590 kW and cutting power of 2 x 650 kW. The shearer employs a jumbotrack 2000 haulage system with haulage power of 2 x 125 kW and is fully automated. The longwall is equipped with 147 two-leg roof supports with a yield load of 1,040 t and a working range of 3 - 5m. The face conveyer is a Bucyrus PF4, 1332mm wide with a 42mm twin inboard chain with 2 x 855 kW CST drives. The longwall is controlled by Bucyrus PM 4 controllers, with the 400 kW PF4/1532 coal crusher and 400 kW SK11/18 beam stage loader also from Bucyrus, and motors manufactured at ATB Morley’s factory in Yorkshire.